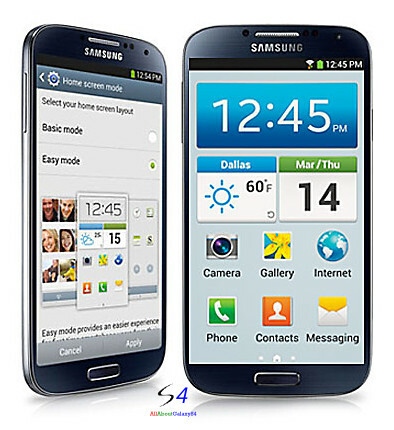 Update 1: FAQs on Galaxy S4 easy mode were added at the bottom of this page. PDF version of all these FAQs can be downloaded from this post. As the name suggests, Easy Mode is designed for non-savvy users, for example, your grandma, to take most of the handset without fiddling around the settings. Actually, the easy mode was introduced in Galaxy Note 2, and all Samsung handset with Jelly Bean 4.1 update (for example, S3, S2, Galaxy Note) also got this feature. We put an entry for it here because this feature has been seriously overlooked. Compared to that in previous handsets, Easy Mode in Galaxy S4 S4 has better usability. In Easy Mode, you will get only three home screens. The main home screen has non removable widgets for the time, date, and weather. Six apps can be added into this screen. Of course the icons are larger. The left home screen is dedicated to phone calling. You can add 9 contacts as favorites for quick calling. Phone functions (calling, contacts, call logs) are accessed from this screen. The right home screen is for your 9 apps with large icons. You can choose any apps from your app drawer. For other apps, you can access them from the app drawer. Different from that in standard mode, all apps can be listed in alphabetical order only. Once in Easy Mode, the settings menu, camera interface are also simplified. Actually, it is sufficient for most users. Another good thing is that you can switch between easy mode and standard mode at anytime without losing any settings in each mode. To switch to Easy Mode, go to Settings — My device — Home screen mode — Easy mode — Apply. To switch back to standard mode, choose Standard mode, then apply. Do you think this Easy Mode is useful? Would you recommend it to your grandparents or parent? Let’me know in the comment box below. Q1 : The icon size in the home screen is different from my friends Galaxy S4. Q2 : Sometimes the camera mode appears to only have six modes. What’s the problem? 2. When the device is set up in the ‘Easy mode’, six camera modes is supported. Do you have any questions on Easy Mode? if you have any questions or encounter any issues with Easy Mode, please let us know your questions or comments in the comment box below. Not sure. But it should be there in Galaxy S3. pantech have this mode long time ago.. I accidentally entered easy mode, when I went back to standard mode, all my pages were lost. The contacts i had grouped, page layouts, everything. Sprint store tech said too bad, nothing canbe done… So don’t switch unless you know for sure you want it!! No zoom in the camera, no option to edit the home screen. In easy mode i cant seem to insert smileys anymore? (usually hit menu button in text messaging and insert smiley). Is there a way to turn this on? A lot of functions are not available in easy mode. Would being in easy mode block call waiting? I don’t know how to delete or remove apps on the right page. What do I do if I want to change the apps ? You can uninstall them. But in easy mode, you have limited options. Does anyone else have the problem that Easy Mode seems to turn off messaging? Unlikely the easy mode turns off messaging. Can you send messages on easy mode? When I switch from easy mode to standard mode, I no longer can find the “Torch” icon. When I tap “Apps”, in the bottom right corner, I do not find it, nor is there a widget tab. How do I turn on the light when I’m in Standard mode. Surely I shouldn’t have to download another app when it clearly is on the phone when i’m in Easy mode. Help! I attempted to remove a contact from my Easy Mode home screen, and I accidentally removed the Contact Screen, so now it looks like just another App Screen. How do I restore it so I can add contacts to my Home Screen again? In Easy mode, the contacts page cannot be deleted. Your can only hide it. You just need to unhide it. You can tap the menu key (3 vertical dots) in any of the screens, then tap edit. Now you can swipe left and right. To the left of the home screen, there are two pages for contacts. You tap shoes to unhide it. BTW, the contacts actually are widgts. As in Easy mode, you cannot add widgts directly. You have to use the contact pages to add the individual contacts. The phone icon is missing on the start up screen, despite being selected in easy mode settings. The other 5 icons are on the front screen but the phone icon is missing from the bottom left position. This position is blank. You can manually add it. Anyway, why do you use easy mode, which is for new users in the first a few weeks.